Born and raised in a New England garrison town, Esther Wheelwright (1696–1780) was captured by Wabanaki Indians at age seven. Among them, she became a Catholic and lived like any other young girl in the tribe. At age twelve, she was enrolled at a French-Canadian Ursuline convent, where she would spend the rest of her life, eventually becoming the order’s only foreign-born mother superior. Among these three major cultures of colonial North America, Wheelwright’s life was exceptional: border-crossing, multilingual, and multicultural. 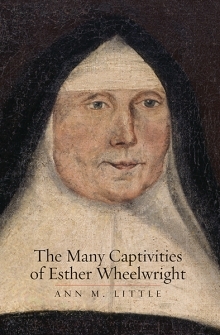 This meticulously researched book discovers her life through the communities of girls and women around her: the free and enslaved women who raised her in Wells, Maine; the Wabanaki women who cared for her, catechized her, and taught her to work as an Indian girl; the French-Canadian and Native girls who were her classmates in the Ursuline school; and the Ursuline nuns who led her to a religious life. Available at Amazon, Barnes & Noble, and Powell’s Books in both hardcover and e-book editions. The story of Wheelwright is unique in its details, but ends up telling a larger story about the lives of women in the region, as well as religion, warfare, status, human nature and rivalry on a local and world stage. This is a book that deserves a permanent place on any bookshelf dedicated to the history of Maine. Coming soon! Historiann will be on Liz Covart’s podcast, Ben Franklin’s World.